2017 is finally here. I welcome you all in the new year. Let’s start this creative journey from today! 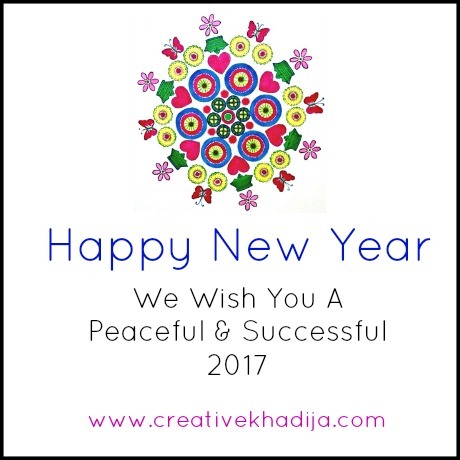 So here is the first blog post of 2017 on Creative Khadija Blog. Alhamdu’lillah for a successful & wonderful 2016 as well as a great start of this new year. 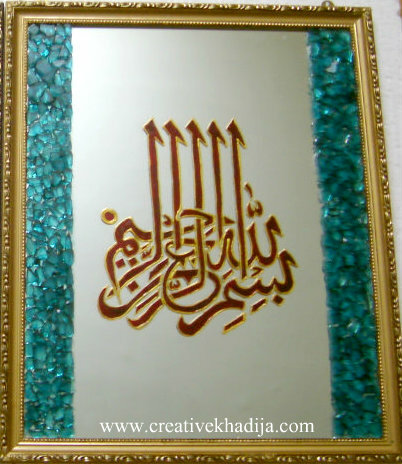 Now I am going to share a glass painting wall art today. 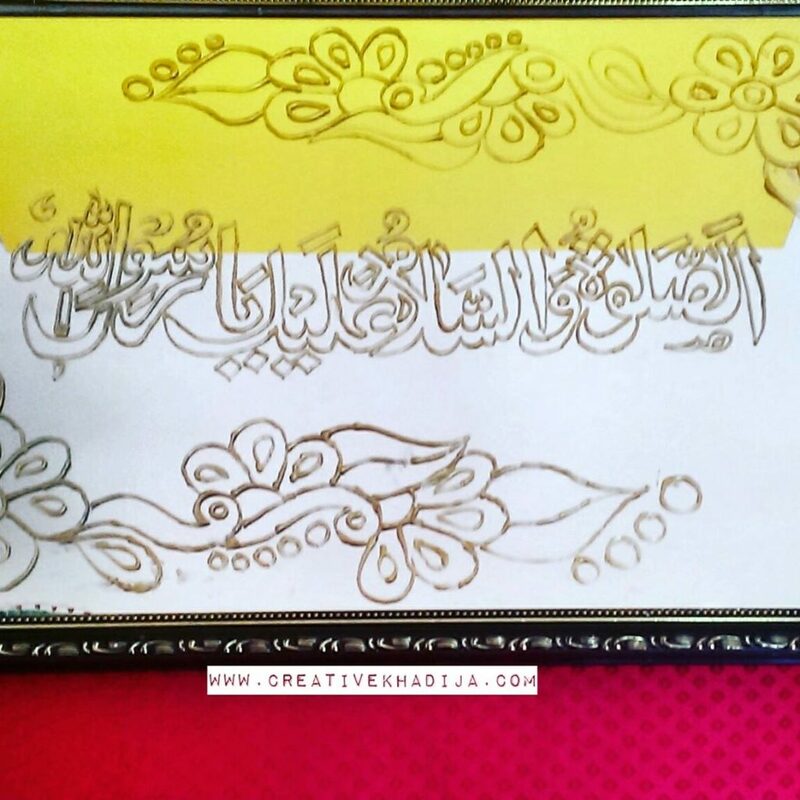 I hope you will like my recent art work. You might check this wall art on my social media networks already but here is a little bit detail now. How is this glass paint wall art looking? I have some variation of colors and designs here. Usually I use two colors only but this time here are 6 colors. 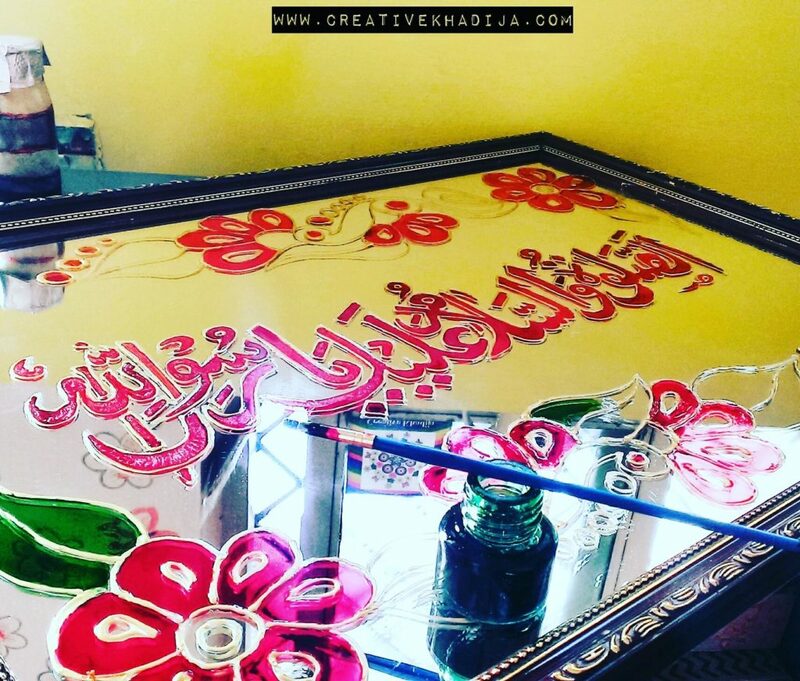 First I trace calligraphy verse on the mirror & then draw free hand floral motive with golden outliner. Let it dry for a couple hours & then it’s ready to fill colors in it. 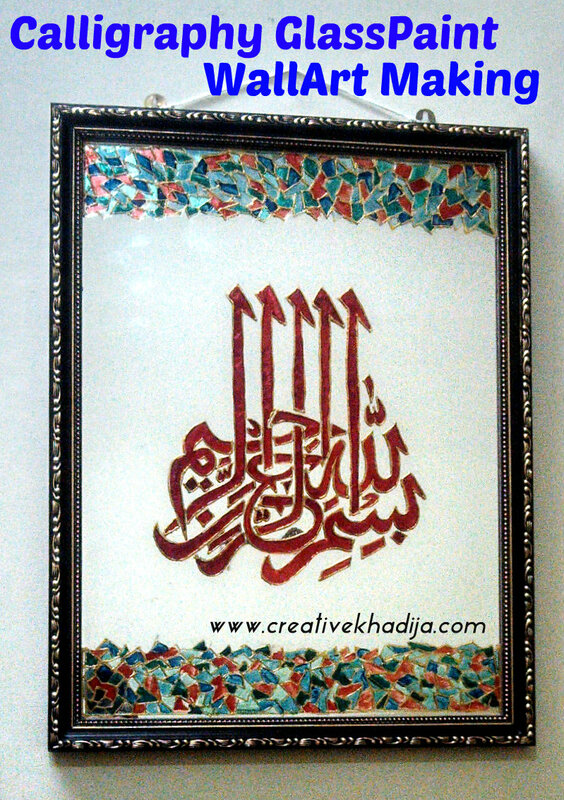 I color the calligraphy design middle part first with crystal line glass paints. Then filled the colors Red, Pink, Green, Yellow, Orange & blue in floral design. Here it is ready! 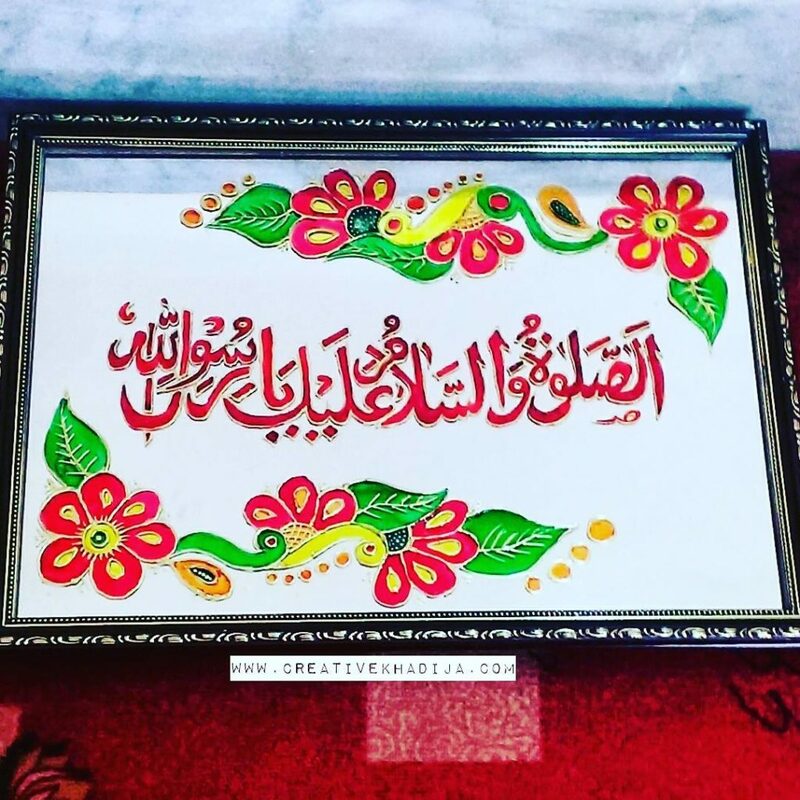 It’s not placed on the floor by the way, As they are holy words, So it should not be on the floor. I place a box on the carpet and put it on for capturing a click. As usual, capturing a mirror isn’t easy you know! Anyways, When it’s completely dry & ready, then you will clean it with a dry paper towel or soft fabric towel. You can make outline again if there is any overlap of paint color. This one is my all time favorite. 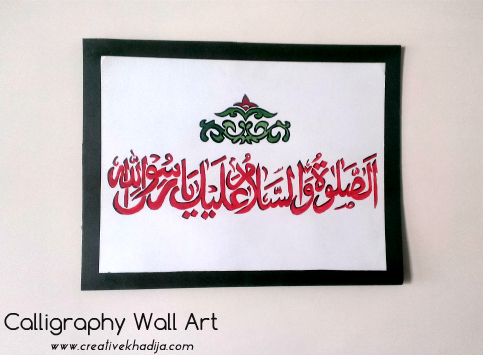 I love this Islamic Calligraphy Wall Art a lot. One of my most favorite art till date. 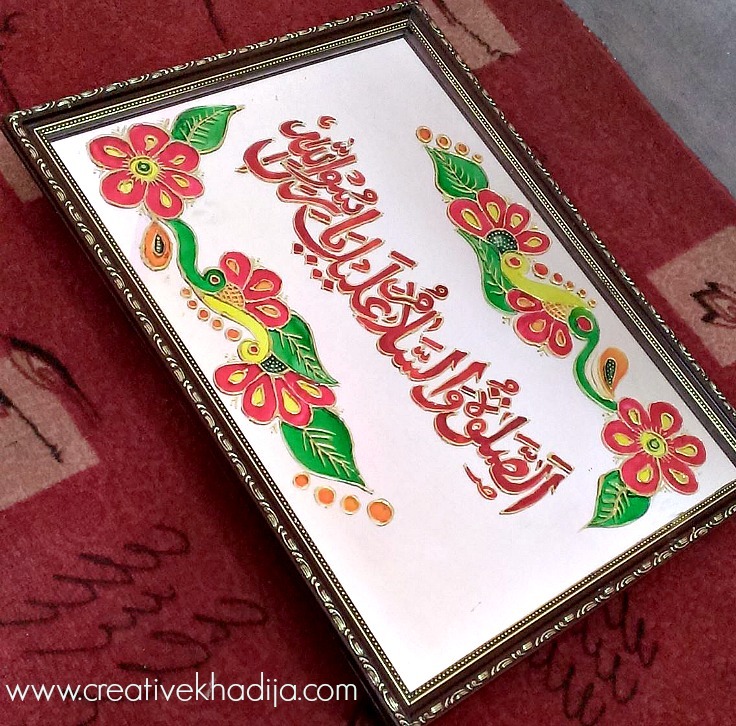 I want to show you a handmade card I made for someone who visited us after performing Umrah. It was a last minute idea & I completed this in an hour. 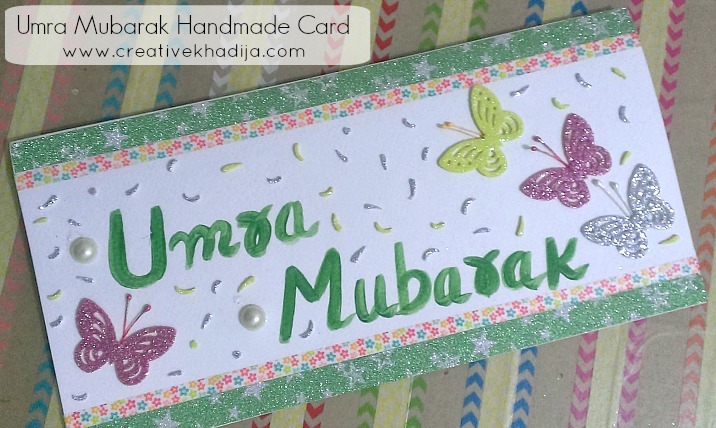 If you are following me on my social media networks, You might already have seen this card making. If you want to buy anything handmade by me, Feel free to contact. 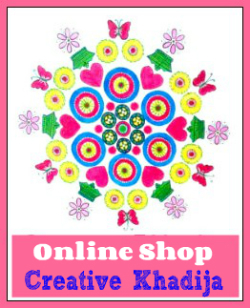 Check here Creative Khadija online shop. 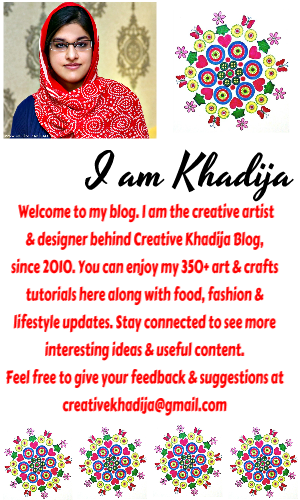 I hope you will like my ideas & tutorials. 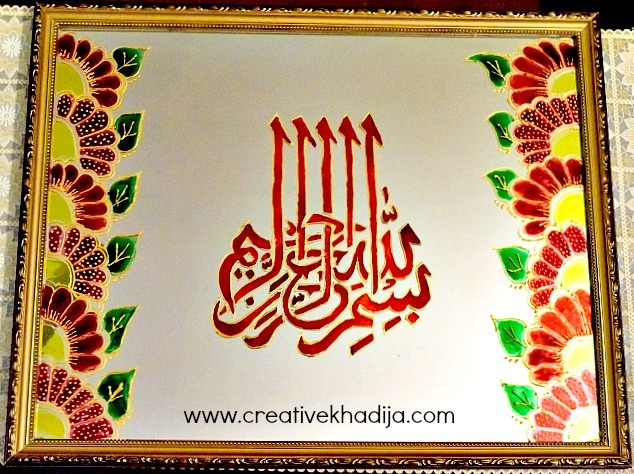 I make these projects for sale & I am glad my clients are always happy & satisfied. 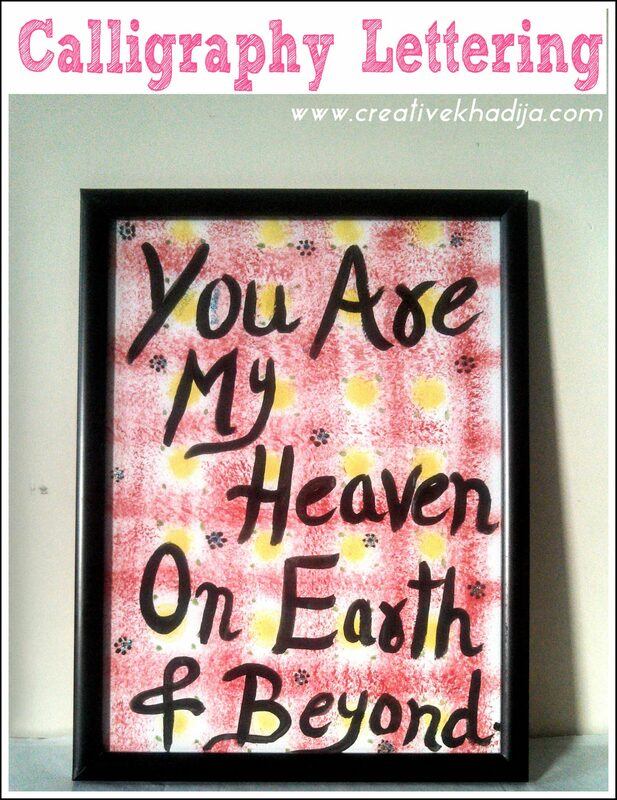 If you want to give someone a gift wall art, This glass paint can be a great option. 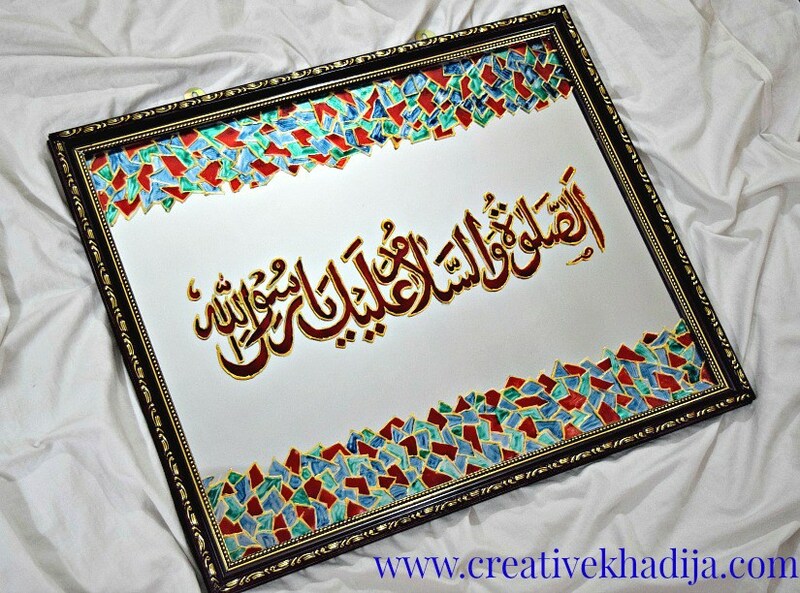 I ship worldwide, So feel free to contact whenever you want to buy a similar glass paint art gift for your family or friends. Anyways, the article is already going long but I want to write some well wishes. I hope your new year will be filled with lots of goodness & blessings of Almighty. You have a fresh start to make your life even better this year. There is a new chapter of your life just started, So you can improve yourself towards betterment. You can design a better lifestyle for yourself in 2017. 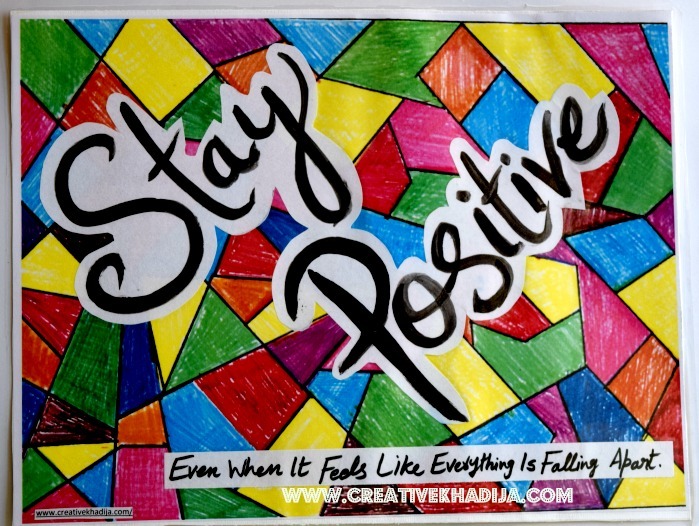 Keep on hardworking & stay optimistic about great result. Let me know if any question or suggestion about improvement. It’s beautiful, you are really talented! Thank you for sharing at The Really Crafty Link Party and happy 2017! Pinned.